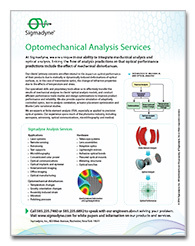 Sigmadyne offers effective trade study and optimum design capabilities to help improve performance of our customers products. An optimization problem statement is formulated to fit the specific design task. This formulation identifies what performance measurement is to be improved, what aspects of the design may be varied, and which quantities must be constrained to be within certain bounds. The example below seeks to minimize the adaptively corrected surface RMS error of a lightweight mirror by sculpting the depth of its core while keeping the weight at or below that of the starting design. 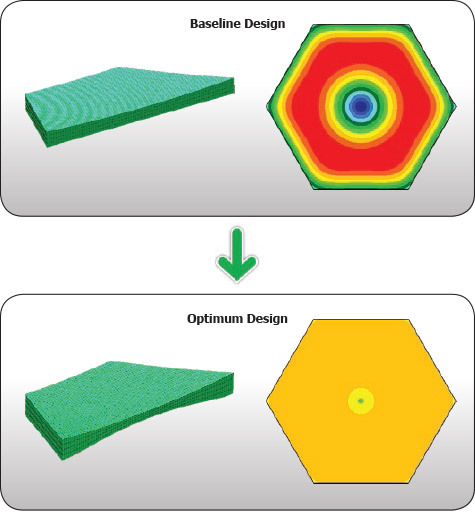 The optimization reduced the corrected surface figure from 29.6 nm RMS in the baseline design to 2.7 nm RMS in the optimum shaped design. Figure 1 – The baseline design of an adaptively controlled mirror is optimized to minimize the adaptively corrected surface figure. In the case of actively controlled optics, design variables can also include the minimum number and placement of actuators.